CAPE CANAVERAL -- NASAengineers think they have pinpointed the cause of dangerous hydrogen leaks thatprompted back-to-back launch scrubs for shuttle Endeavour, and they plan toconduct a fuel-loading test by the first of July. Shuttle program managers,meanwhile, said they think the problem can be repaired in time to proceed witha launch attempt scheduledfor July 11. "They have goodconfidence that they know what the problem is and how they can fix it,"Kennedy Space Center spokeswoman Candrea Thomas said Saturday. Endeavour and its sevenastronauts have to launch no later than July 14 to get to the InternationalSpace Station and complete a complex assembly mission before the arrival of arobotic Russian space freighter carrying critical supplies. A delay past July 14 wouldpush the launch to July 27 and have a significant ripple effect on a stationassembly mission set to launch Aug. 18 on shuttle Discovery. "Obviously, therewould be a downstream impact," KSC spokesman Allard Beutel said. Significant leaks ofgaseous hydrogen from a line that vents the substance from the shuttle'sexternal tank prompted NASA to scrub a June 13 launch attempt, as well as asecond try Wednesday. Some cryogenic liquidhydrogen, which is minus 423 degrees Fahrenheit, always "boils off"-- or changes to a gaseous state -- during fueling. The vent line maintainsproper pressure levels within the tank by carrying excess gaseous hydrogen to aflare stack about 1,000 feet from the shuttle. There, the highly flammablesubstance is safely burned off. Thomas said engineers thinka slight misalignment between the line and a carrier plate that connects it tothe external tank is causing an internal Teflon seal to pull out of place,creating a path for the leaking hydrogen gas. Engineers think technicianscan fix the misalignment and install an alternative seal that would provide atighter fit and stop the leak. Technicians this weekendare taking exact measurements of the misalignment. Next week, they willdisassemble the vent line, the carrier plate and a quick disconnect valve thatenables the line to separate from the tank at liftoff. The plan then calls fortechnicians to try to correct the misalignment and install an alternative sealbefore a fueling test near the end of the month. Engineers will load morethan 500,000 gallons of super-cold liquid hydrogen and liquid oxygen into theshuttle's 15-story external tank. Leak rates will bemeasured, and if they are within engineering specifications, NASA will pressahead with plans to get back into a countdown posture and make another launchattempt July 11. "It's a confidencetest," Beutel said. The launch-scrubbing leakson Endeavour were nearly identical to one that caused a delay for a Discoverymission in March. 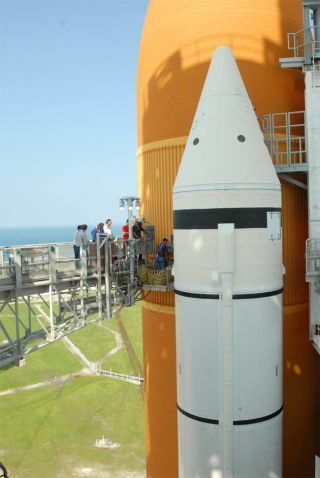 That time, however, a swap of seals allowed NASA to loadDiscovery's external tank and proceed with a mission to deliver a fourth andfinal set of massive American solar wings to the station. A Russian Progress cargocarrier is slated for launch July 24 on a station supply mission. The unmannedfreighter can loiter in orbit for five days but must dock at the outpost nolater than July 29. Endeavour consequently mustlaunch by July 14 to complete a 16-day mission and leave the station before theRussian ship arrives. Seven astronauts aboardEndeavour plan to deliver the thirdand final section of the $1 billion Japanese Kibo science research facilityto the station.